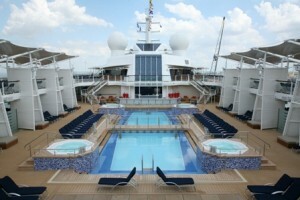 Equinox is truly an appropriate name for Celebrity Cruises latest Solstice-class ship. Twice a year, the equinox marks a near-perfect balance between length of day and night across the planet, and the Celebrity Equinox offers cruise travelers an excellent balance of size, style, efficiency, and quality. Carrying 2,850-passengers, the 122,000-ton Equinox is the second in a series of five “Solstice-class” ships. The vessel offers all the seagoing firsts of the Celebrity Solstice: a half-acre Lawn Club with real grass and full-time groundskeeper and the Hot Glass Show presented in collaboration with The Corning Museum of Glass. The interior design of the Solstice-class ships is a world apart from the retro-style favored by the majority of cruise lines – there’s nothing out there nearly as stylish. Those familiar with Solstice will find Equinox an almost identical vessel, albeit with some minor cosmetic changes. 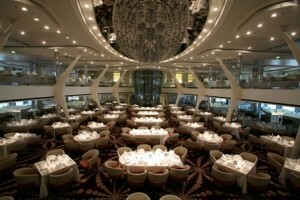 Changes onboard Equinox includes more color in the mostly white Silhouette Dining Room, other décor changes include in the Silk Harvest restaurant, Martini Bar, and Equinox Theater, which launched new shows. The Sun Deck has been enlarged and can accommodate 100 more deck chairs. Additionally, minor tweaks have been made to staterooms — safes have been relocated from closets to cabinets to allow for slightly more hanging space. Equinox features 1,426 staterooms, 85 percent of which include a veranda. Each stateroom is equipped with flat-screen TVs with an amazing on demand audio/visual system includes a library of over 5,000 songs, storage and closet space, spacious bathrooms and plush European bedding. The ship offers wireless Internet access throughout. The popular AquaClass staterooms — 130 in all — designed to offer a soothing, spa-focused ambiance. Located in close proximity to the ship’s two-story “AquaSpa by Elemis,” AquaClass guests will enjoy unlimited access to the spa’s Persian Garden aromatherapy steam room, featuring heated ceramic loungers and the Relaxation Room, which offers panoramic vistas from comfortable lounge chairs. AquaClass guests also enjoy unlimited, complimentary access to the ship’s exclusive, Mediterranean-influenced specialty restaurant, Blu. Celebrity may have topped itself with the introduction aboard Equinox of a “24-Karat Gold Facial.’’ The treatment uses an alchemy of expert touch, medicinal plants, Rose Quartz and a pure 24-karat gold leaf mask to speed up cell renewal. Guests who experience it will also be able to enjoy a special cocktail inspired by the treatment itself. The “Golden Kiss Martini” features Golden Supreme vodka, cucumber juice, agave syrup and lemon juice, muddled with fresh mint. With the launch of the new ship, Celebrity started “Celebrity Life,” a series of enrichment programs that encompasses three distinct program categories: “Savor,” “Discover,” and “Renew.” Programs include learning a new language with Rosetta Stone to courses that teach guests to use their iPod through Celebrity’s “digITal” series. – there is literally something to interest everyone on board. The program will be rolled out across the fleet by November. Like Solstice, Equinox is going green by utilizing 216 solar panels throughout the ship. The energy collected then becomes part of the ship’s power grid — enough to operate 7,000 of the vessel’s 25,000 energy efficient LED lights. Celebrity Equinox begins its inaugural season with a cruise to the Norwegian Fjords on July 31 out of Southampton. Other departures from Southampton include a 10-night “Best of Europe” itinerary to Rome. Then ship will then sail a series of 13-and14-night “Ancient Empires” cruises through October, featuring two new ports of call: Haifa and Ashdod, Israel. These voyages also include an overnight stay in Alexandria, Egypt. Fares for 13- and 14-night cruises begin at $2,099 per person. On November 5, the ship will sail a transatlantic voyage to Fort Lauderdale, Florida, where it will begin a series of alternating 10- and 11-night “Ultimate Caribbean” voyages through April 2010. Prices begin at $1,199 per person. All aforementioned prices are based on inside staterooms, double occupancy. Visit Celebrity Cruises Web site for more details. Filled Under Advice, Cruise Profiles, gallery, Reviews, Tripblog, What's New? WOW! 2,850-passengers? That’s a huge number :). Nice article, tnx for sharing and i love the picture with the pool. Traveled from Rome on August 31st on the Equinox My first cruise was on Windstar. Have travelled Regent, Oceania 4 times. 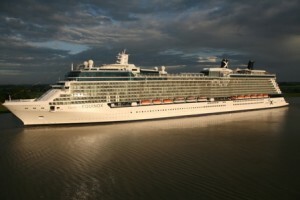 This is my second Celebrity Cruise. Booked in Aqua Class. Everything wonderful. Staff in Blu new us as did the staff in Silk Harvest which we loved, We did however eat in all special dining venues and loved them. Can’t believe this ship held so many as we never waited for anything except an occassional elevator. My children traveled with their children on the 6 and 8 Solstice in a fantail suite and adjoining concierge room. Everyone had a blast. The grandchildren wanted to go back on the Equinox with us. Great ship. Great try! Great Job Celebrity! have avoided the $1,200 out-of-pocket expense? Maybe. If they had purchased third-party travel insurance, they could have received upfront financial assistance and they might have gotten their money back more quickly.